Cotton Mouth disease also knows as Mouth Fungus is a disease your fish can get and it needs to be dealt with quickly. Cotton Mouth disease is not as common as the white spot disease, but, it is highly infectious and contagious. 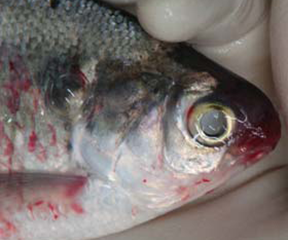 The victim fish shows a whitish fungus around the cheeks and lips. The lips may become swollen and rot away. Sometimes a rotten strip of lip attached only at one end will move in and out of the mouth as the fish breathes. Fish infected with Mouth Fungus lose their appetite and their movement become sluggish. If no adequate treatment is given, the whole frontal part of the head may be eaten away finally and the fish dies. Unless the affected fish is of considerable value, it should be killed before this fatal disease attack the other occupants, of the tank. Think about it... is trying to save the life of one fish worth risking the death of the rest of the fish in your aquarium? - Swabbing the mouth of the victim fish with a soft cloth dipped in a strong salt solution. Then you must then keep the patient isolated in a bucket or jar containing a strong salt water. - Try swabbing the lips with a 5 per cent silver mercury preparation. - Make a solution of Terramycin or Aureomycuin by dissolving 50mg per gallon of water, a rapid cure is expected within 48 hours. You can try all of the above remedies, but the most common remedy is the popular Methylene blue solution . To perform this remedy the sick fish should be placed in a jar, bucket or a treatment tank into which has been added a methylene per blue to color the water deep blue.